The pack is the most important thing in the lives of African Wild Dogs, and the key to their success. They are superb hunters as a group, and their creative strategies and choreography result in successful kills in at least half of their attempts. This is the highest kill rate of any predator in Africa, and African Wild Dogs are one of very few species that enjoy a regular mealtime. To them, teamwork is everything. African Wild Dogs have a very tight social structure. The alpha male and female are the only breeding pair, and the entire pack hunts and cares for the pups. Individual dogs take turns as nanny to the pups and as hunters so that nobody gets stuck babysitting all the time. It is ironic that African Wild Dogs are also one of the most endangered species in Africa. They are prey to lions, leopards, and hyenas, but these ancient enemies will not wipe them out. Extinction, if/when it happens, will come at the hands of humans. One For All (back view). 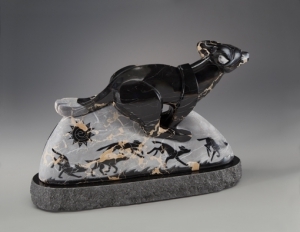 Dogs animate across the stone in successive poses of the run. The African Wildlife Foundation is trying to save African Wild Dogs through education of local people and hands-on construction of bomas, enclosures that protect livestock from wild animals. The AWF trains local scouts to monitor wild dog packs and alert herdsmen and farmers when packs are in the neighborhood. Local people are taught alternative ways to protect their animals other than killing African Wild Dogs. 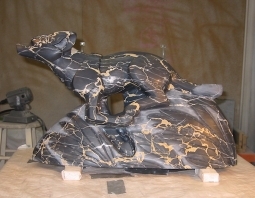 The stone is Portoro, an Italian decorative marble with the same black, white, and gold coloring as the African Wild Dog. 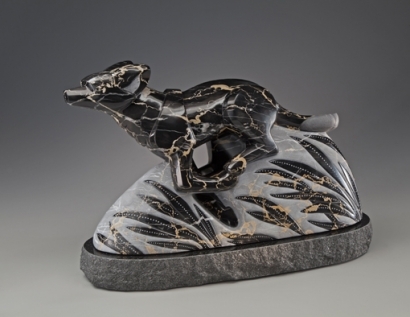 Each block of Portoro has different color patterns just as each wild dog has distinctive markings, making it the perfect stone for this gorgeous animal. 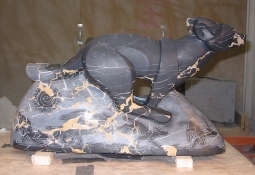 Decorative marbles are extremely tricky to carve. In fact, they are mostly used for architectural decoration in floors and staircases, and in church altars. 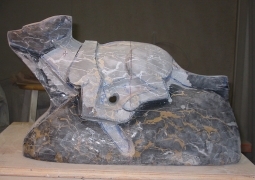 I have carved many kinds of decorative marble into animal sculptures and then vowed I would never carve that stone again because it is so labor-intensive. Such was the case with Portoro, but I simply can’t resist the color and end up carving it every several years. Passion drives my work. 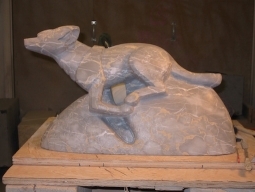 I was captivated by the African Wild Dog and had to make this stone sculpture. 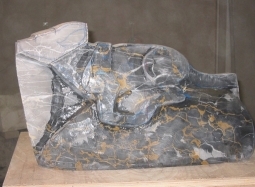 Every aspect of creation with Portoro Marble is a challenge. 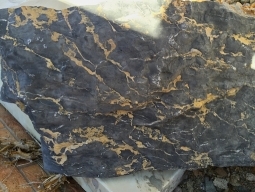 The black stone is very brittle and the gold vein is very soft—this is a huge concern since any percussion would cause a break along the color lines. This makes it a grind-only stone. There may also be tiny invisible gaps between colors, which makes this a glue-as-you-go stone, i.e. 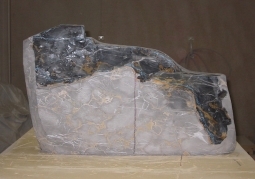 very low viscosity cyanoacrylate should be poured over the stone after each carving session. Since we have both hard and soft stone in one block, one must have total pressure control of the grinder because soft stone will come off much faster than hard stone. Also, grinding is much slower than cutting. One sheds blood in the carving of Portoro for a glorious resolution. The finishing is equally challenging. One must use a paste of oxalic acid and tin oxide to get the gorgeous shine and color—the acid melts the stone and the tin oxide polishes it as it is melting. This process is extremely messy and the paste goes flying all over the studio when applied to the stone with a rotary tool and felt bob. Here’s the topper–this stuff is quite poisonous, so every inch of the sculptor’s body must be covered and a vapor-fume respirator must be worn. Wow. I have included progressive shots of the process of making “One For All”. I have also included a second view of the reverse side of the sculpture—something I rarely do, but am motivated to show here since this sculpture is so beautiful. 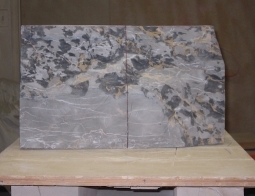 Raw Block of Portoro Marble. Squaring off the rough block. The dark patches are glue.